Google Glass' latest software update demonstrates how Mountain View is still experimenting with the facecentric UI. Included in the latest update (XE12 for those keeping track) will be a new "wink" function that allows users to capture a photograph with a simple wink of their right eye. Users can turn it on or off by swiping over to Settings. It will even work when the display is off. Aside form the "exploratory" eyelid-centric UI, users will still be able to capture images with the headset's physical camera button or by "ok glass"-ing. In order to take advantage of the new Palinesque function users will need to have a Glass device purchased after October 28, or have taken part in the complimentary swap for the latest dorkified hardware. No, that cyborg isn't flirting with you. They're just buying shoes or something. In addition to the wink-wink snap-snap, Mountain View has added a slew of new software goodies. XE12 will finally deliver a lock screen that will activate whenever Glass is powered down or the device detects that it has been removed from your head. Users unlock their device by replicating a pattern of taps and swipes. Glass explorers will also find deeper integration with Google products including Google Play Music All Access; Hangouts for chats, photos, and video calls; and a simplified process for sending videos directly to YouTube. The company also announced a forthcoming iOS version of the MyGlass app (which the company accidentally released early, and later pulled from the app store). This expansion of the Glass ecosystem beyond Android is a smart move. It provides Glass with a better shot at mass adaption than new hardware form factors like the unfortunately Samsung-tethered Galaxy Gear. 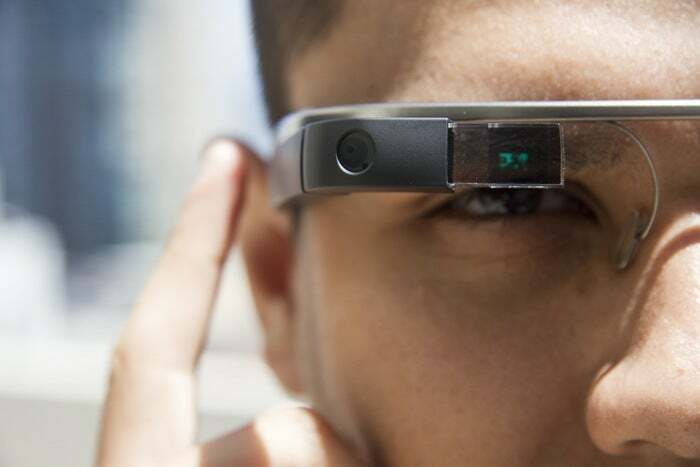 This story, "Google Glass 'wink' update blurs the line between tic and functionality" was originally published by TechHive.